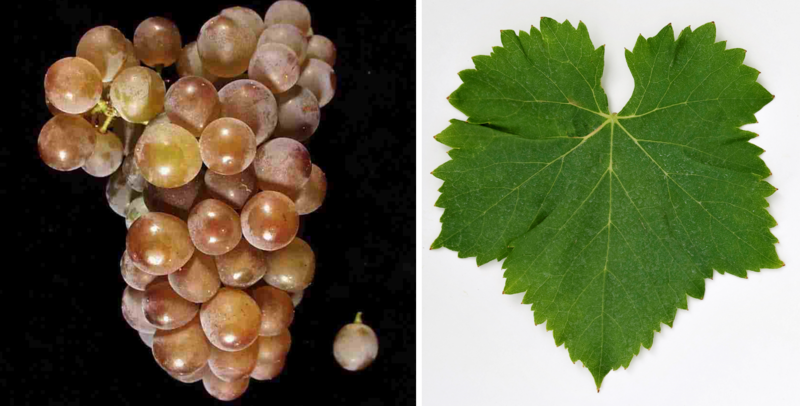 The white grape comes from Spain and belongs to the group of Garnacha varieties (see there the descent). Synonyms are grouped alphabetically by country Gray Grenache ( Australia ); Grenache Gris, Grenache Rouge ( France ); Rosco dos Pinheiro ( Portugal ); Garnacha Gris, Garnacha Rioja, Garnacho Rojo, Garnatxa Gris, Garnatxa Roja ( Spain ); Piros Grenache, Szürke Grenache ( Hungary ). It is probably a color mutation from Garnacha Tinta (theoretically also vice versa) with greyish-reddish berries, which are very similar in their resistance to disease. Opposite the Garnacha Blanca is she more productive. It produces fruity, rather acid white wines with cherry and raspberry flavors. In Spain, the variety is in the regions La Mancha and Navarra cultivated on 77 hectares. In France she finished as Grenache Gris end of the 1980s still about 10,000 hectares of vineyards. Today she occupies especially in the Roussillon, and to a lesser extent Languedoc and at the southern Rhone only 1,635 hectares and serves mainly as a blend. There are more stocks in Greece (645 ha), South Africa (2 ha) and Thailand (6 ha). In 2010, a total of 2,366 hectares of vineyards were reported (Statistics Kym Anderson ). This page was last modified at 17 November 2018 at 09:03.